Color Wheels: Do they teach you how to achieve color harmony? 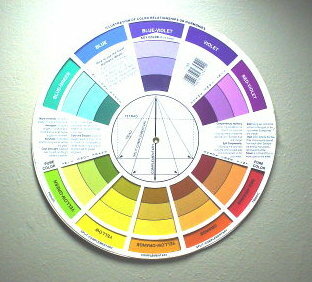 Color wheels help you choose a harmonious color scheme for your art work. This makes it easier to mix colors that work with each other to unify your painting. I have owned several of them, and I encourage students to do the same. If you have worked through my page about using 3 primary colors (one red, one yellow, and one blue) to mix secondary and tertiary colors, then you are ready to learn color harmony on a deeper level. Over time, it has become clear to me that the best way to achieve harmony is to use analogous colors—those that are close to one another. On color wheels, all of the colors—the primaries, secondaries, and tertiaries—exist in relationship to one another. The primaries are located equidistant from one another, with the secondaries and tertiaries between them. There are 6 tertiary colors in any given color scheme (based on the primary colors you choose) and these will always be in perfect harmony. Instead, what you do is to use the six tertiary colors (two reds, two yellows, and two blues), instead of three primaries (one red, one yellow, and one blue). This will give you a greater range of light-filled colors that work well with each other. Remember in the earlier page on using three primary colors, if you blend all three of them, you produce 'mud'. So, choose an orange red and a violet red, an orange yellow and a green yellow, a green blue and a violet blue. In oil painting, an orange red might be cadmium red light, alizarin crimson is a violet red (some perceive it to be a bluish red—a cold red). Primary colors with an orange tint tend to be “warm” colors and a colors with violet or green tend to be “cool”. If you want a brilliant violet, then mix violet red with violet blue. If you use green blue, the result will be dull purple because the green in the blue cancels out the intensity of the violet red. By now, you know that a red can be biased toward either orange or blue on the color wheel. So, when it is time to mute the analogous colors, use a split complement. On the color wheels, they lie in bands directly opposite each other. For example, in the red color scheme, the yellow green is the complement to the violet in red violet, violet, and blue violet. The blue in blue green is the complement to the orange in red orange, orange and yellow orange. Either mute an analogous color with its complement or place it next to its complementary color to make it stand out more. Using six tertiary colors on your palette will give your art a more expressive flavor. 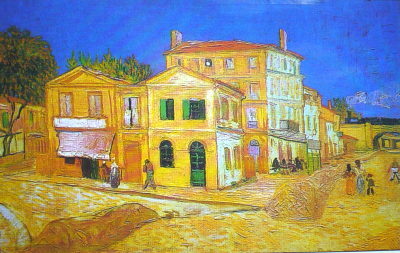 The 19th century Dutch painter Vincent van Gogh adopted this technique, and it shows in his colorful paintings. Claude Monet, the French impressionist painter, would use tertiary colors to add depth and volume. For example, he would use yellow green for the local color under the leaves and blue green for the top of the foliage, reflecting the blue sky and creating a deeper green. So use colors wheels to pick out the color scheme you want and related colors for harmony. Experiment and try different color schemes—don't use the same color scheme all the time. I find myself using red and orange based color schemes a lot. I break away from that every once a while, however, and try using blues or greens as the dominant colors in my art. Remember that different colors convey different emotions, so choose a scheme that will reinforce the emotional component you want for your painting.